The report is divided in 3 panels. Summary page contains statistics charts and top failures from current state of the report. Donut charts represent the ratio of errors/warnings/infos/passed checks or hits. 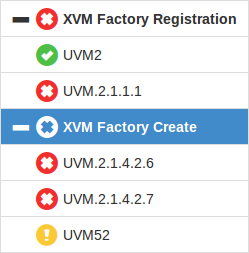 Under the charts, checks and files with the highest number of failures are displayed. Hovering over the checks or files will pop-up a filtering button that can be used to add that check or file to the filters. The hits table contains all the hits of the selected check or category and allows filtering and sorting. To sort the table after severity, check, file or line, click on the column header of that specific property. Multiple sorting can be achieved by holding <Shift> pressed when clicking on the column header. Hovering over the checks or files column will pop-up a filtering button that can be used to add that check or file in the filters. Above the hits table a quick filter bar is displayed. It can be used to filter furthermore the hits displayed in the table. The quick filter applies to any information (check, file, line, message) available in the table and only the matching rows will show in the table. The small chart above the quick filter represents the ratio and absolute values of hit severities displayed in the table. Below the hits table a details area shows the information of the selected category, check and hit. Selecting a check or category in the tree will display the hits table for it. The details area will be updated with the information about that category or check. The status of a category or a check is computed based on the contained hits. Filters work on the information displayed in all components (summary page, checks tree, hits table). Status filters are filtering out the hits and checks that don't match and are applied on selection. 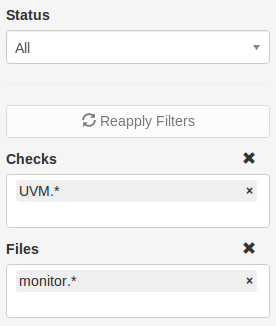 Checks and files filters are filtering out the hits and checks that don't contain match. They are applied only when Reapply Filters button is pressed. The filters can also contain regular expressions.